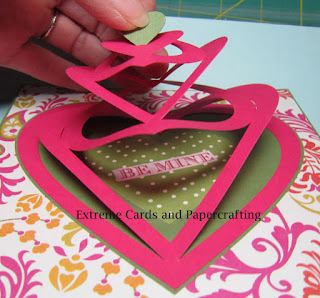 Pull tab in the center of this valentine heart papercraft and the paper stretches apart to reveal your sentiment. 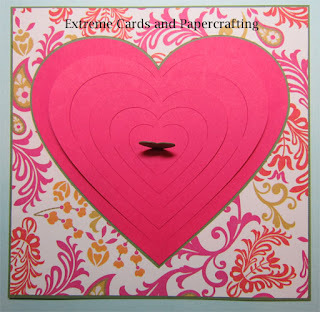 Strategic cuts on the pop up card create a net from the concentric hearts, with a surprise message underneath. 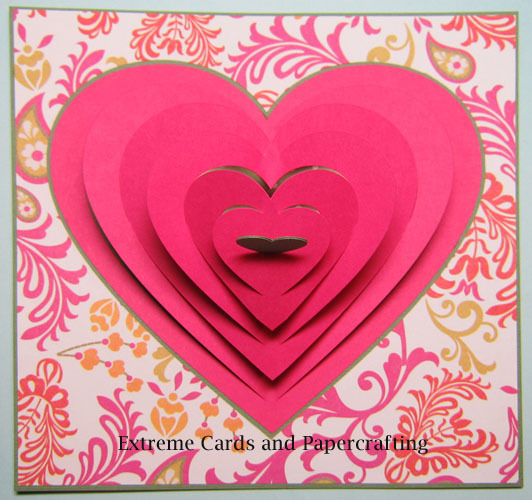 Click to download file set: Silhouette Studio, PDF, DXF, SVG (how to use my SVG files in Cricut Design Space). Files download for free. A huge thank you to the many readers who support my site with a small contribution when downloading. Pay what you wish for the tutorial and to support this site. Suggested contribution for this project is $1.00. 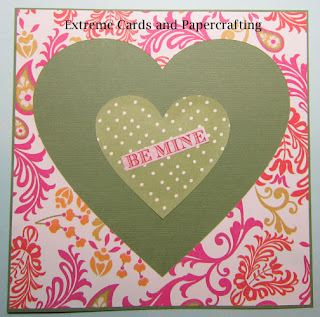 Cut a 6" square base card from card stock (shown here in solid green). 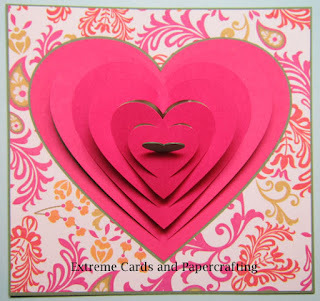 Cut stretchable heart from card stock (solid pink). 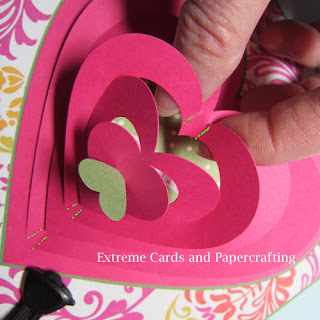 Cut small hearts with tabs from card stock (solid green). Cut frame from decorative paper (paisley with white background). 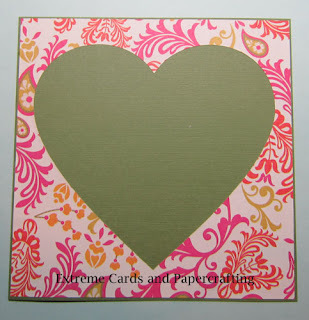 Cut inner heart (sentiment heart) from paper that contrasts with the base card (green and white dots). 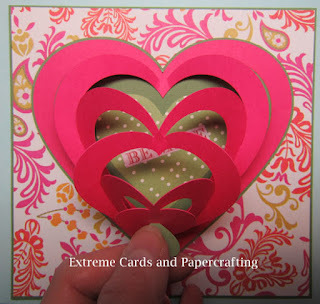 Slip the small hearts with tabs through the slit in the middle of the heart. 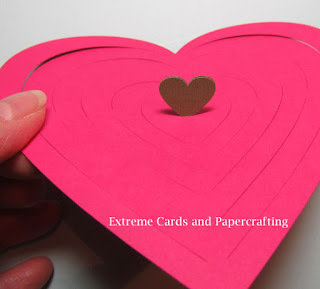 Glue the hearts together. Pull apart the tabs. 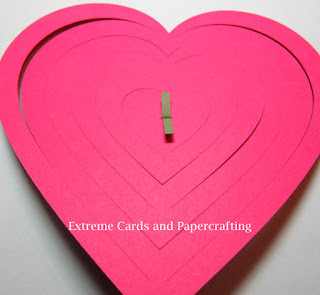 Adhere the tabs to the back of the heart. 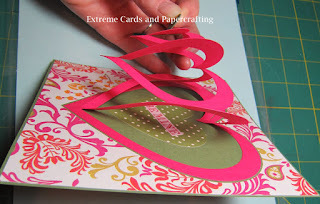 Adhere the frame to the base card. Create a sentiment. 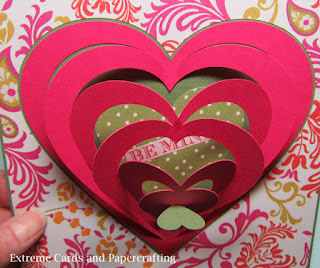 Adhere the sentiment heart to the center of the heart frame. You can eyeball this. It doesn't have to be exactly in the center. 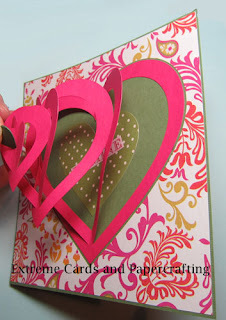 Spread adhesive on the outer-most heart. 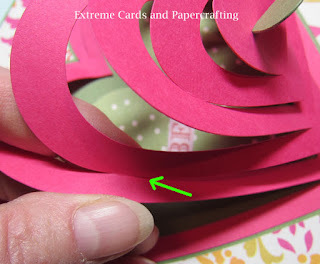 Adhere inside the decorative frame. 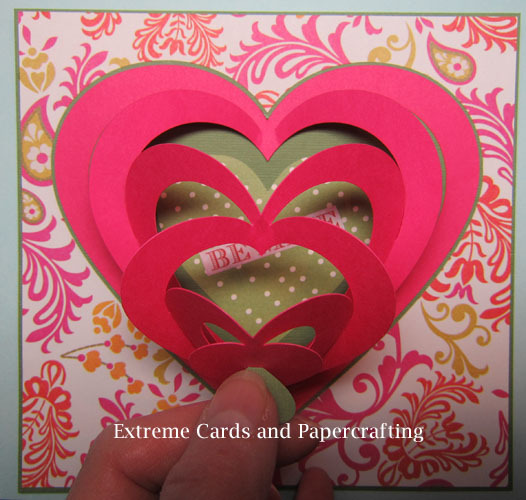 Pull up the center of the heart. 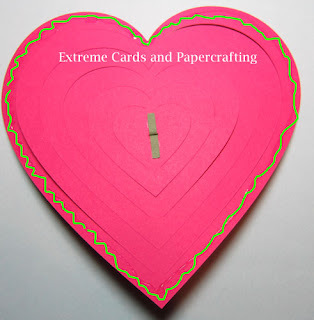 At the places where hearts attach at the bottom and top, encourage the hearts to pull up more easily by creasing as shown by green dots. 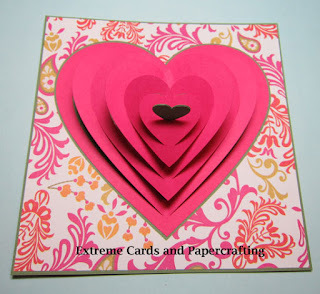 Where the hearts are attached at the sides, crease where they attach.